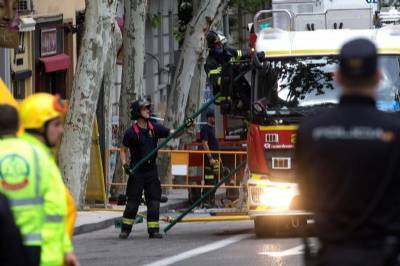 A team of around 50 firefighters continue to search for two builders lost among the rubble of a block which collapsed in Madrid on Tuesday. Both the missing contractors were working on the fifth floor of the apartment building in the Chamberí neighbourhood, at number 19 of the C/ General Martínez Campos, which partially fell down yesterday. Rescuer workers spent the night searching for the builders without success, and started again at first light this morning. Police dogs trained in finding missing persons, as well as robot-type machine for removing rubble and other heavy objects, sound-detectors, cameras and microphones have been employed in the search. The operation is proving to be extremely complex as parts of the block are still falling down. Residents in neighbouring apartment buildings were evacuated yesterday following the collapse at number 19, and have not yet been allowed to return to their homes. The cause of the seven-storey block collapse, at around 17.00 yesterday evening, has not been clarified, although major renovation works were being carried out at the time. None of the flats was occupied, although a team of ‘around 18 to 20’ builders was on the premises, according to neighbours. Other than the missing two, another contractor, aged 40, had to be treated on site for an elbow injury and the rest escaped unharmed. Witnesses say the floor of the top storey caved in and parts of it landed in the central atrium on the ground. Works on turning the block, which was built in 1931, into luxury apartments had been ongoing for around five weeks.